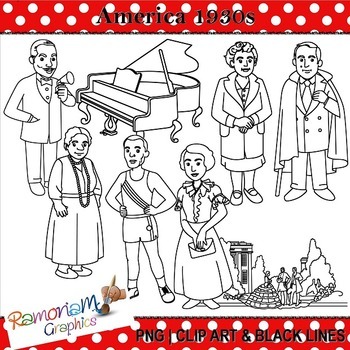 Famous Americans Clip art set, commercial use ok. This set contains some of the prominent figures of the 1930s, America. 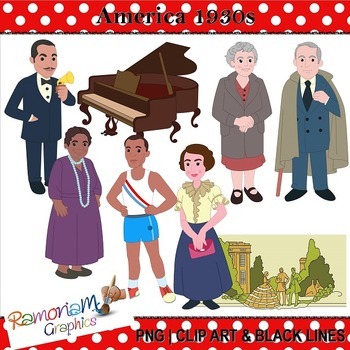 You will get 3 copies of each image (23 images in total) in the following formats: black and white; colored with colored outlines and colored with black outlines. All images are in PNG format and are 300dpi. You may use the art work for personal & commercial use (commercial "printing" may require the purchase of a license, please contact me to discuss). If you are using them on an item to be sold or on a webpage/blog, you will need to give credit somewhere on the product or provide a link to re-direct viewers to my store. Full terms and conditions are included with the set in the download. Thank you and I hope you enjoy my product!